CFEngine is a distributed system for managing and monitoring computers across an IT network. Machines on the network that have CFEngine installed, and have registered themselves with a policy server (see Installation and Configuration), will each be running a set of CFEngine component applications that manage and interpret textual files called policies. Policy files themselves contain sets of instructions to ensure machines on the network are in full compliance with a defined state. At the atomic level are sets, or bundles, of what are known in the CFEngine world as Promises. Promises are at the heart of Promise Theory, which is in turn what CFEngine is all about. For many users, CFEngine is simply a configuration tool – i.e. software for deploying and patching systems according to a policy. Policy is described using promises. Every statement in CFEngine 3 is a promise to be kept at some time or location. More than this, however, CFEngine is not like other automation tools that "roll out" an image of some software once and hope for the best. Every promise that you make in CFEngine is continuously verified and maintained. It is not a one-off operation, but a self-repairing process should anything deviate from the policy. CFEngine ensures that the actual state of a system is in compliance with the predefined model of desired state for the system. If it is not in compliance CFEngine will bring it into compliance. This is known as convergence. That model is represented by one or more policies that have been written using the declarative CFEngine policy language. The policy language has been designed with a vocabulary that is intuitive, yet at the same time can still support the design of highly complex IT systems. Those policies are distributed across all hosts within the system via download from the policy server. Every host will then interpret and execute each of the instructions it has been given in a predetermined order. CFEngine continually monitors all of the hosts in real-time, and should the system’s current state begin to drift away from the intended state then CFEngine will automatically take corrective action to bring everything back into compliance. There are basically two categories of machines in a CFEngine environment: policy servers and their client hosts. Policy servers are responsible for making policy files available to each of the client hosts that have registered with it (a.k.a. bootstrapped), including itself. Hosts on the other hand are responsible for ensuring they continuously pull in the latest policies, or changes to policies, from the policy server. They are additionally responsible for ensuring they remain fully compliant with the instructions contained within the policy files, at all times. The role of a particular machine where CFEngine is deployed determines which of the components will be installed and running at any given moment. There are a number of components in CFEngine, with each component performing a unique function: components responsible for implementing promises, components responsible for organizing large networks of agents, and other components responsible for providing the infrastructure of CFEngine. These components form the basis of automation with CFEngine. They are independent software agents running on the various systems that make up your infrastructure. They communicate with one another as shown in the following figure, using a protocol that allows each host to distribute promises, act upon them, and report status to a central server. All CFEngine software components exist in /var/cfengine/bin. cf-execd is the scheduling daemon for cf-agent, similar to cron. It executes and collects the output of cf-agent and e-mails any output to the configured e-mail address. cf-execd runs cf-agent locally according to a schedule specified in policy code (executor control body). After a cf-agent run is completed, cf-execd gathers output from cf-agent, and may be configured to email the output to a specified address. It may also be configured to splay (randomize) the execution schedule to prevent synchronized cf-agent runs across a network. cf-execd keeps the promises made in common bundles, and is affected by common and executor control bodies. See also: cf-execd reference documentation. By starting this daemon you can set up a line of communication between hosts. The server is able to share files and receive requests to execute existing policy on an individual machine. It is not possible to send (push) new information to CFEngine from outside. This daemon authenticates requests from the network and processes them according to rules specified in the server control body and server bundles containing access promises. See also: cf-serverd reference documentation. cf-monitord is the monitoring daemon for CFEngine. It samples probes defined in policy using measurements type promises and attempts to learn the normal system state based on current and past observations. Current estimates are made available as special variables (e.g. $(mon.av_cpu)) to cf-agent, which may use them to inform policy decisions. 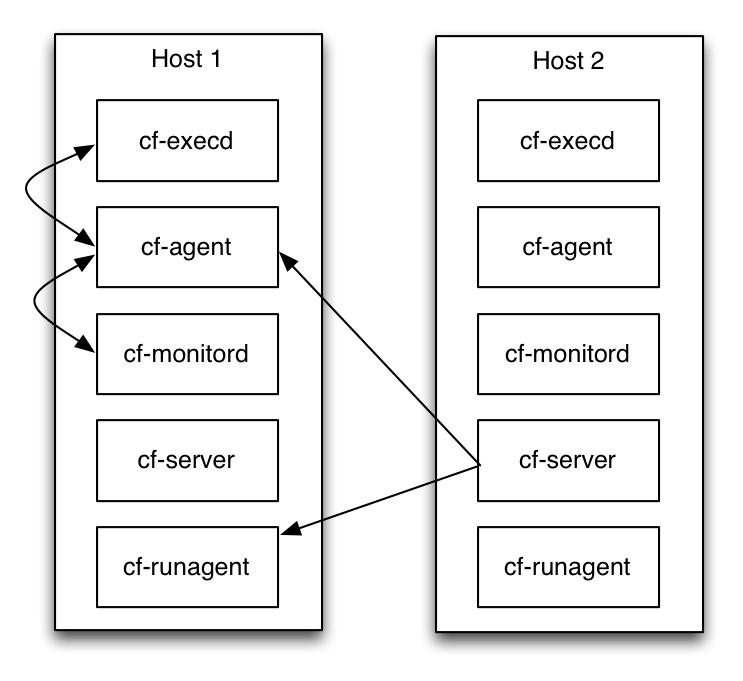 cf-monitord keeps the promises made in common and monitor bundles, and is affected by common and monitor control bodies. See also: cf-monitord reference documentation. cf-agent evaluates policy code and makes changes to the system. Policy bundles are evaluated in the order of the provided bundlesequence (this is normally specified in the common control body and defaults to just the main bundle if unspecified). For each bundle, cf-agent groups promise statements according to their type. Promise types are then evaluated in a preset order to ensure fast system convergence to policy. cf-agent is the instigator of change. Everything that happens on a client machine happens because of cf-agent. The agent is the part of CFEngine that manipulates system resources. cf-agent's only contact with the network is via remote copy requests. It does not and cannot grant any access to a system from the network. It is only able to request access to files from the server component. See also: cf-agent reference documentation. The CFEngine key generator makes key pairs for remote authentication. See also: cf-key reference documentation. cf-promises is CFEngine's promise verifier. It is used to run a "pre-check" of policy code before cf-agent attempts to execute. cf-promises operates by first parsing policy code checking for syntax errors. Second, it validates the integrity of policy consisting of multiple files. Third, it checks for semantic errors, e.g. specific attribute set rules. Finally, cf-promises attempts to expose errors by partially evaluating the policy, resolving as many variable and classes promise statements as possible. At no point does cf-promises make any changes to the system. In 3.6.0 and later, cf-promises will not evaluate function calls either. This may affect customers who use execresult for instance. Use the new --eval-functions yes command-line option (default is no) to retain the old behavior from 3.5.x and earlier. See also: cf-promises reference documentation. cf-runagent is a helper program that can be used to run cf-agent on a number of remote hosts. It cannot be used to tell cf-agent what to do, it can only ask cf-serverd on the remote host to run the cf-agent with its existing policy. It can thus be used to trigger an immediate deployment of new policy, if their existing policy includes that they check for updates. Privileges can be granted to users to provide a kind of Role Based Access Control (RBAC) to certain parts of the existing policy. cf-runagent connects to a list of running instances of cf-serverd. It allows foregoing the usual cf-execd schedule to activate cf-agent. Additionally, a user may send classes to be defined on the remote host. Two kinds of classes may be sent: classes to decide on which hosts cf-agent will be started, and classes that the user requests cf-agent should define on execution. The latter type is regulated by cf-serverd's role based access control. See also: cf-runagent reference documentation.